The heavily modified Maybach will make its world debut at Geneva next week. Next week, we’ll be waving goodbye to the Mercedes-AMG S65 when a special Final Edition of the V12-powered sedan will be revealed at the 2019 Geneva Motor Show. 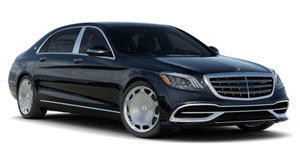 In the future, AMG will continue to offer its V12 powerplant in ultra-luxury Maybach models. Thankfully, this means Brabus will continue to extract more power from V12 Maybachs. Ahead of the Geneva Motor Show, the German tuner has previewed its latest creation: the Brabus 900, which is a new version of the tuner's heavily modified Maybach S650. As the name implies, the luxury limo’s 6.0-liter twin-turbo V12 has been upgraded to produce 887 hp and 1,106 lb-ft of torque. Brabus hasn’t said how it managed to achieve this, but it’s a significant power boost over the standard model, which produces 621 hp and 738 lb-ft of torque. The tuner has, however, provided details about the car’s fuel economy – not that this is probably much of a concern to anyone who can afford it. According to Brabus, the modified Maybach has a combined fuel consumption of 11.9 liters per 100 kilometres, which translates to about 19.8 mpg in the US. In the city, that number goes up to 13.8 mpg, and on the highway it drops to 27.4 mpg. Despite the massive power output, CO2 emissions are 279 g/km. On the outside, the Brabus 900 looks fairly tame compared to some of the tuner’s other exuberant creations, with only a new front bumper, different rims, and some Brabus logos differentiating it from the standard model. Inside, the cabin is as luxurious as you’d expect for a Maybach. The example shown in the teaser video has copious amounts of brown leather, a rear-seat entertainment system and ‘Brabus’ entrance lights. More details will be revealed at the Geneva Motor Show next week, where the Brabus 900 will make its world debut.